It’s summer and we’re finally getting some warm, sunny days. What better way to soak in the most of this summer bliss than to spend your evenings at a line-up of outdoor concerts. Tacoma Concert Band and Franke Toby Jones are both hosting a series of free outdoor concerts and it all happens in August. The Tacoma Concert Band will be performing 5 consecutive nights from August 8th to August 12th throughout the South Sound area. Alternatively, every Thursday night in August at 6:30 p.m. Franke Toby Jones will be hosting free concerts featuring multiple musical groups. All concerts are FREE, all ages are welcome. Bring a lawn chair, blanket, picnic, and enjoy! Tacoma Concert Band – Comprised of 60 players, the Tacoma Concert Band performs a wide range of music including works of J. S. Bach, Alfred Reed, Richard Wagner, Gustav Holst & John Philip Sousa. 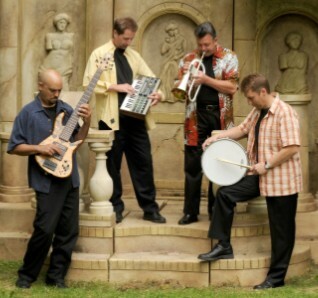 Voetberg Family – The Voetberg family band plays bluegrass, gospel, country, folk and jazz. Ranging in age from 9 to 22, they have garnered 10 WA State fiddle championships, 8 WA State Music Teachers Association awards for keyboard and vocal performance, 20 regional fiddle championships, 12 Top Five placements at the National Fiddle Competition and the title of 2007 National Young Adult Fiddle Champion. Hook Me Up – Hook Me Up is a popular and dynamic quartet performing a wide variety of contemporary and standard jazz, Latin, funk, swing, rock ‘n roll, original tunes and a few things you wouldn’t expect to hear from just 4 instruments. A Touch of Class – This 20 piece swing dance band plays fabulous and well-known standards and loved ballroom music from the 1930s and 1940s. A Touch of Class has been together for 20 years and has performed far and wide in the Puget Sound area including at the Elks Lodge, Puyallup Fair, Puyallup Meeker Days, Fort Lewis, Kiwanis auction dinners, senior communities, charity functions and more. Pacific Lutheran University’s Jazz Under the Stars Series is still going every Thursday Night in the Mary Baker Russell Amphitheater. Both nights the Keck Observatory is open for some star gazing. Free. Complimentary coffee provided by Seattle’s Best.